Maybe you’ve already heard about Microsoft Graph and the Graph API. Microsoft Graph is the way resources in the Microsoft cloud are connected to each other. The Graph API is an API you can use to access Microsoft Graph, and browse (or traverse) through all the resources. You can use the Graph API when building your own applications, but Microsoft is moving all their apps, tools etc. to the Graph API as well. Azure Active Directory PowerShell v2 is moving from the Azure AD API’s to the Graph API as well. This automatically implies that Azure AD PowerShell v2 comes with new cmdlets and new options. 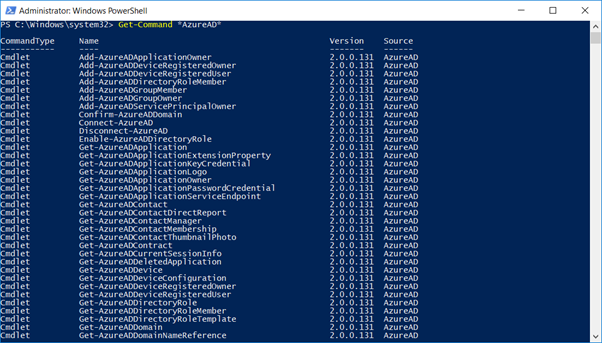 The output of these cmdlets should be similar of course (creating a new domain, group or user in Azure Active Directory), but that these cmdlets are in no way compatible with the old Azure AD PowerShell. Unfortunately, you have no choice then moving to Azure AD PowerShell v2. 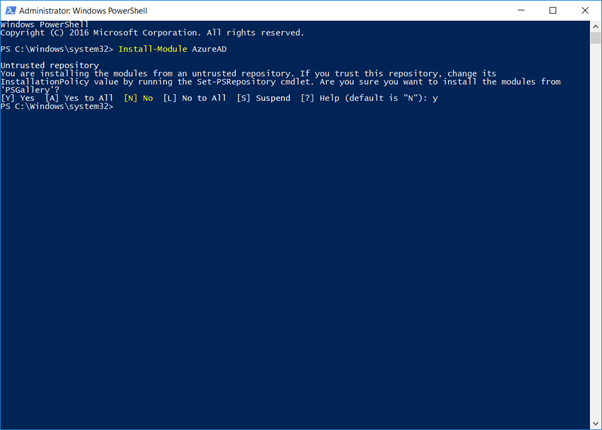 The existing PowerShell v1 will of course be supported for quite some time as it is impossible for everyone to convert their processes, cmdlets, scripts etc. from one version to another. Note. We’ve seen similar when Microsoft moved from Azure ASM to Azure ARM. It has been taken years for Microsoft to move everything to ARM, so no worries for end-of-support scenarios anytime soon. 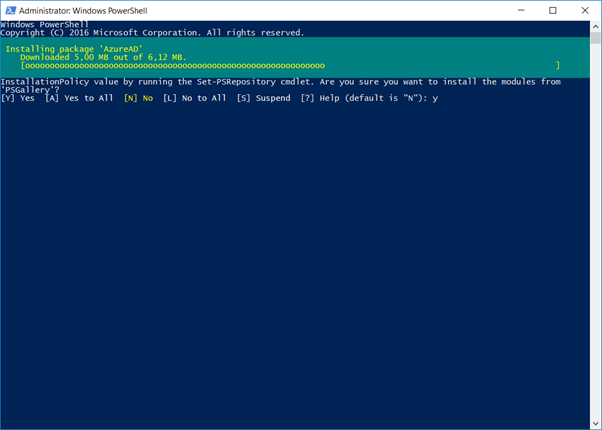 Installing Azure AD PowerShell v2 is easy, just install the module using the Install-Module command. This will download the module from the PowerShell repository. When executed you will receive a notification about an untrusted repository. Click [Y] or [A] to continue. The module will be downloaded and installed. In future blogposts I will continue with the Azure AD PowerShell v2 module. Every now and then you find these small little things that turn out to be very useful. 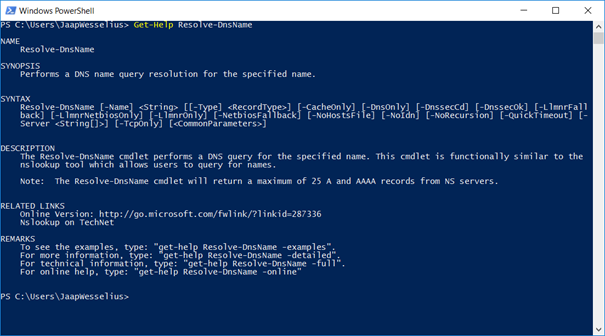 The Resolve-DnsName cmdlet in PowerShell is such a brilliant thing, and it is a nice replacement for NSLOOKUP. 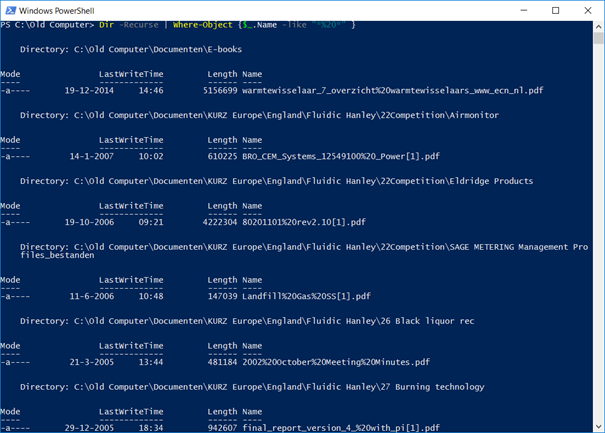 Since it is a PowerShell cmdlet you can easily use it in scripts. It looks like this command was introduced in Windows Server 2012 R2, but I found out only a couple of days ago. Using the Get-Help Resolve-DnsName command you can get more information, if you need some examples on how to use it you can use the -Examples option, or the -Detailed and -Full options. Very useful for an Exchange admin, and it can be used in PowerShell scripts. New-PSSession : [webmail.posh-workshop.com] Connecting to remote server webmail.posh-workshop.com failed with the following error message : The WinRM client sent a request to an HTTP server and got a response saying the requested HTTP URL was not available. This is usually returned by a HTTP server that does not support the WS-Management protocol. For mor e information, see the about_Remote_Troubleshooting Help topic. Once changed Remote PowerShell works as expected. Customer is running Exchange 2010 with NetBackup for backup. At some point the backup stalled and the Exchange server (passive node) froze. Only hard reboot turned the node back to life. After lots of troubleshooting it turned out that there were several million (small) log files located in C:\Program Files\Veritas\NetBackup\online_util\ which caused the backup to freeze. The problem is… how do you remove so many files from a (local) hard disk? 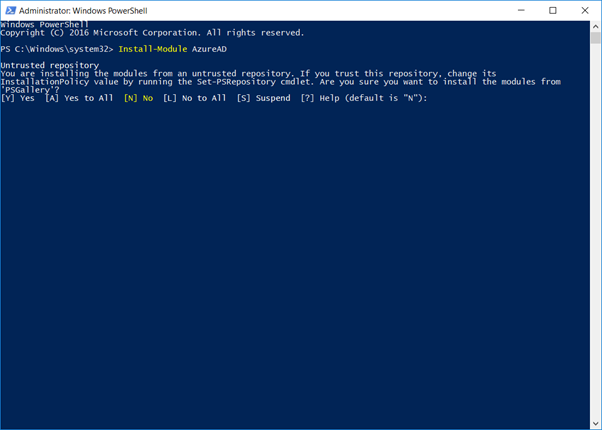 A command prompt or Windows Explorer is generally speaking not a good idea, but you can do this with PowerShell. It took approx. 3 minutes to load all files in the $Logfiles array. As a side note: The admins also tried it using a command prompt and a standard del command, this took approx. 53 minutes to remove 100,000 files. A second batch with 2,000,000 logfiles took 1500 seconds (15 minutes) to remove. Disk activity however kept raising during this 15 minutes up to 100%. To prevent too many issues with (disk) performance customer decided to remove the logfiles in batches of 500,000 items until all logfiles are removed.